Tag Archive | "Puerto Rico"
Let’s look at the math of debt. 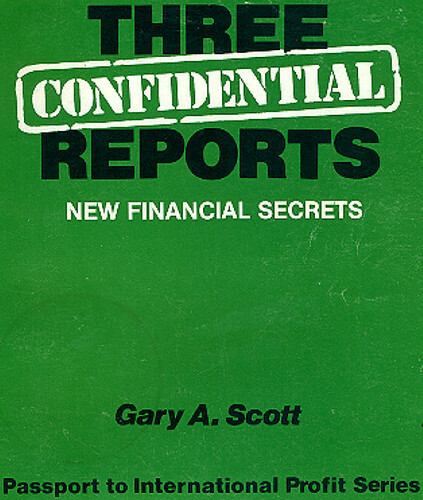 A basic investment tenant that value investors use is to rely on mathematically based financial news rather than rumor and conjecture-based economic news. 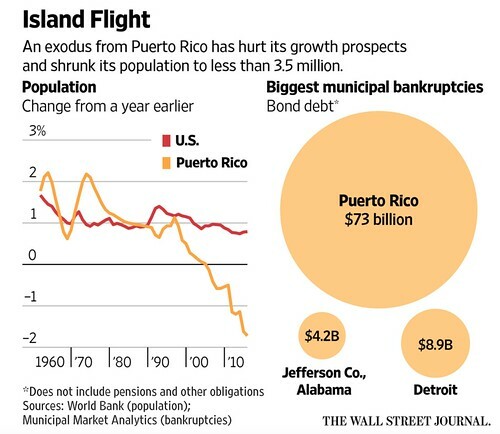 So let’s apply some math to last week’s Wall Street Journal article “Puerto Rico to request bankruptcy protection”. The article says that Puerto Rico’s debt at $73 billion is about eight times worse than the previous worst municipal default which was Detroit’s $8.9 billion. Please note the fine print “Does not include pensions and other obligations.” This means, whatever the debt numbers show, it is actually worse. Let’s looks at the math of this debt based on the census. The chart below is from the US census and compares US households to households in Puerto Rico. According to that US Census (2), Puerto Rico had 1,261325 households. This means that each household ($73,00000000000 divided by 1,261325) has $57,875 of debt. Even a couple of years ago Puerto Rico declared this unpayable. This is the last weekend to order fresh Mother’s Day roses. Orders will be accepted through Monday, May 8, 2017. 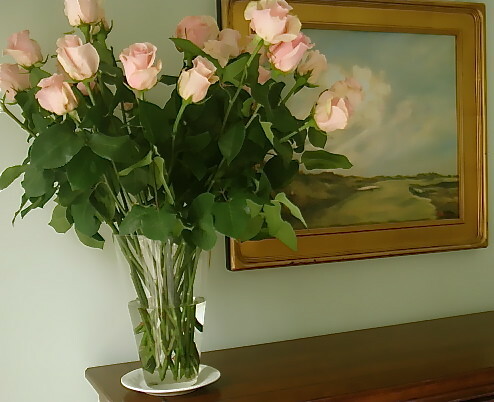 See details on how to order fresh Ecuador Mother’s Day roses here. Let’s compare this to the math of US debt. The chart below is from the US Treasury Department website. 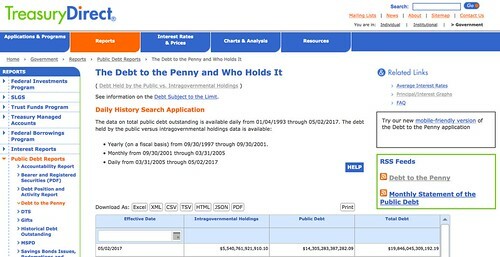 According Treasurydirect.gov (3) US debt is $19,846,045,309,192.19 (19 trillion). The US Census graph above shows that the US has 105,480,101 households. That math ($19,846,045,309,192.19 divided by 105,480,101) works out to $188,149 of debt per household. In other words, US debt per household is 3.25 times higher. According to economywatch.com (4) the GDP Per Capita for Puerto Rico in year 2015 was US$37,951.75 and for 2016 was forecast to be US$37,869.31. According to the same website the GDP per capita was $55,805.20. The GDP per capita in the US is 1.47 times ($55,805.20 divided by 37,951.75) greater than in Puerto Rico. US GDP is 1.47 times higher than in Puerto Rico. US debt is 3.25 times higher than in Puerto Rico. That’s the math of debt. As with the * in the debt statistics for Puerto Rico, the US debt numbers do not include future obligations like Social Security, Medicare, Medicaid, etc. either. Is the US debt repayable? This actually does not matter. No one ever expects any government to ever pay off all its debt. The bigger question is whether the US debt service is sustainable. Puerto Rico’s problems hinge on the fact that the Commonwealth cannot service its huge debt payment. One answer of course is to leave the US. But this presents its own dilemma. 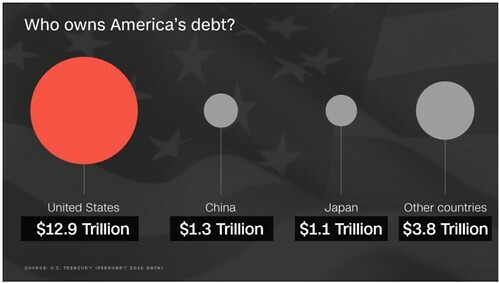 From CNN.com article “Who Own US Debt” (5). Living abroad can reduce one’s cost of living. Living abroad can bring new adventures and expand horizons. But living abroad may not escape the reverberations of a US debt default. If the US defaults on its debt, shock waves will cause economic disturbances around the world. This is why Merri and I in recent years have focused on three steps to survive a debt shakeout. One step is to take care of one’s one good health. The second is the increase profits and safety of our savings with slow moving good value, purposeful investments. 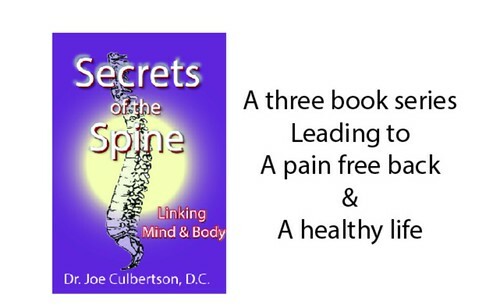 The third step is to live a simpler life in Smalltown USA, or wherever, and have a micro business that offers a product or service that will be of value regardless of circumstances. Merri and I are creating micro businesses doing things we love that are good for our community and that fulfill our lives. A look at the math of US and global debt distribution can help us get to the heart of the matter. Our ability to cooperate lays at the core of humanity’s success. Yet due to the competitive nature that exists in the weft and warp of societies around the world, there are flaws in the weave of our international tapestry. The tensions and imbalances mean that the global economy occasionally needs a reset. Either a new burst of productivity created by some new technology or a diet of austerity balances the numbers so they make mathematical common sense. During the reset, some people win. Others lose. We do not know when or what will happen. Events are beyond our control, but we can and should make life better with a micro business that assures we’ll land on our feet, however the world turns. Turn your passion into profit. Become more valuable to others with your own micro business now. 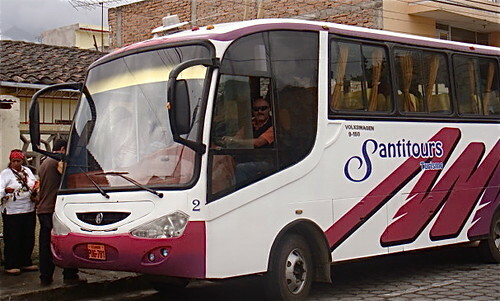 Ecuador Singles are very safe in many parts of Ecuador. A reader recently sent this note. Hello Gary, I have thoroughly enjoyed reading all your emails on Ecuador. I would love to visit you when I have some funds available, and because of the economy my funds are non existent for travel now. I have been told by several people and particularly by a Panamanian friend (female), that Ecuador is very dangerous because of the Colombian drug situation. Crime is big and is it dangerous for a single female such as myself, to go there. Here is my reply. There is a popular misconception that Ecuador is a dangerous place. This is like saying New York City is a dangerous place. Sure there is danger in some parts of New York. My research suggests that if you are in Manhattan and go to East and Central Harlem it can be a bit sketchy. Ditto for Washington Heights. In Brooklyn, East New York, Brownsville and Crown Heights may not be good places to stroll at night. Yet overall New York City has the lowest crime rate among the ten largest cities in the United States. Since 1991, the city has seen a continuous fifteen-year trend of decreasing crime. Then there are those who know what to do and are safe even in dangerous places. One site I researched said of East Harlem: I have an uncle, who lived with his wife in one of the housing projects in East Harlem and manage to raised three children there since living there in the 80’s and 90’s. But he just moved out about a year ago. He said that the changes in the area got much better after the 2000’s. He said, he would stay, but they already had saved enough money and already buy property in Puerto Rico. This is true of Ecuador as well. There are places you won’t find me walking around and I pretty well know what to do… how to look out. I have only been robbed three times in 41 years of global travel… once in London and twice in the US… all at home or within two blocks of home. Yet many parts of Ecuador are far safer than in North America. We have dozens of single women readers who have moved from the US and Canada now living in Ecuador and have never heard a single complaint. They are probably safer in Ecuador than in most US cities. I have written about this extensively at this site. If you have concerns please search the phrase “ecuador crime” at this site. You will see numerous recent articles we have published. There is also a good BBC article about crime in South America. You will notice that the article does not mention Ecuador as one of the high crime areas in Latin America. Ecuador has always seemed like a very safe place to us. We have taken thousands of people to Ecuador and though groups and tourists are always targets for crime… wherever they travel in the world… we have never experienced a violent incident. From a security point of view one has to be on the lookout for pick pockets in tourist areas but other than that our thousands of readers who have visited Ecuador report few problems… as mentioned not one incidence of violence. We advise people at this time not to stay or visit the area of Mariscal Sucre nor go anywhere near the Colombian border or in the province of Esmeraldas. Crime in Guayaquil in the 14 years we have been there was once bad but due to government measures is not as bad now. 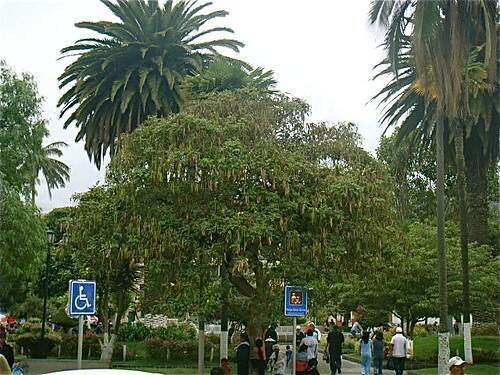 Parks in Quito have trouble with theft and the like and it is good to just avoid these areas. Our site covers our thoughts on risk extensively. Here are links to just a few of the numerous articles we have posted about Ecuador safety. To assist those interested in Ecuador Ecuador Living has established a full time full support research and assistance team to help Ecuador Living subscribers in any way required. This complete service includes our staff being able to provide personal responses to your questions about Ecuador crime. Other services offered include scanning Ecuador newspapers looking for unique properties and put our subscribers directly in touch with sellers … thus avoiding brokerage fees. We also help our subscribers by asking developers (since we are not brokers and do not to accept real estate commissions) to provide discounts to our subscribers if they buy property. For example, one Quito property seller is offering a $10,000 discount to our subscribers on a spectacular Quito condo. 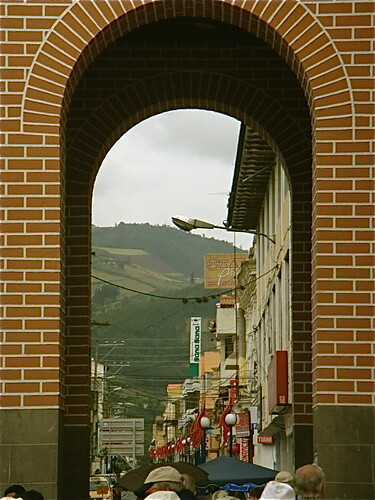 In another example there are 4 buildings at Primavera II in Cotacachi. The first building has condos at $46,500. Ecuador Living subscribers can subtract 2% off most of the prices of most new units at Primavera. In another case the Vistazul condos north of Manta provides our subscribers a $10,000 savings plus a free Galapagos cruise. Helping subscribers find real estate is only one part of our service. If you have an interest in traveling, investing, living, buying property or doing business in Ecuador a subscription to Ecuadorliving.com brings many benefits. One huge benefit in using our service versus relying on brokers or travel agents is that we are not trying to sell real estate. For our modest subscription you get our honest opinion based on 40 years of international business and 13 years of living, traveling and doing business in Ecuador. Ecuador Living subscribers gain access to our extensive contacts plus share the input from over 18,000 subscribers who continually let us know what they see hear and experience good and bad. We conduct real estate tours to help our subscribers learn Ecuador’s real estate market in the most efficient way. Join us in Ecuador or Florida or Both. See the best Ecuador property for you. Find the best real estate offers. 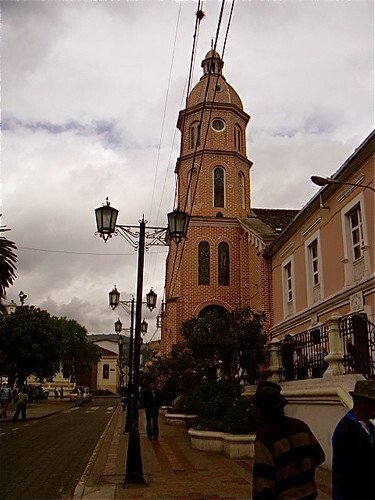 Know more of Ecuador. To help you experience a bigger adventure in this wonderful nation, to broaden your horizons, to expand your awareness of all Ecuador offers, we are providing deep discounts in 2010 for those who sign up for multiple tours. Join us at our upcoming courses and tours. Feb. 18-19 Coastal Real Estate Tour $499 Couple $749 or discounted fee for multiple tours below. Feb. 21-22 Imbabura Real Estate Tour $499 Couple $749 or discounted fee for multiple tours below. Feb. 23-24 Quito-Mindo Real Estate Tour $499 Couple $749 or discounted fee for multiple tours below. Feb. 26-27 Cuenca Real Estate Tour $499 Couple $749 or discounted fee for multiple tours below. Mar. 17-18 Imbabura Real Estate Tour $499 Couple $749 or discounted fee for multiple tours below. Mar. 19-20 Cotacachi Shamanic Tour $499 Couple $749 or discounted fee for multiple tours below. Mar. 22-23 Coastal Real Estate Tour $499 Couple $749 or discounted fee for multiple tours below. Mar. 25-26 Cuenca Real Estate Tour $499 Couple $749 or discounted fee for multiple tours below. Here is an Ecuador export tour update that continues our thread on ways to earn globally with small international businesses. Our Ecuador export tours visit many Ecuador markets… textiles in Cotacachi and weavings in Peguche, leather in Cotacachi… wood carving in San Antonio de Ibarra. Here is our last group arriving in Otavalo. How many of you are packed? I stay packed. July 3rd is right around the corner. Pack smart, bring a larger suitcase than you need, and be prepared to buy another big one ($8) to get all your treasures home. We are already saving, aren’t we? Yesterday, my husband and I returned from Puerto Rico and let me tell you about the prices there! Wow! Maybe we should all be taking our treasures to Puerto Rico to sell. I saw so many things we are going to see in Ecuador and were they ever expensive in Puerto Rico! Now on to our Import/Export adventures. On one of our days together (July 8) we’ll visit the town of Otavalo and the market there. This market is the largest indigenous market in all of South America. The reason we are going on Wednesday is…not as many shoppers and much better prices than on a Saturday. We like those better prices, don’t we? While in Puerto Rico I saw a summer cape which I have bought all over Ecuador for $10.00. In Puerto Rico, also at a market, that same type of cape was $42.00, and it was not near as pretty as the ones we are going to see in Otavalo. Do you see the profit there? I also just finished going through my latest Coldwater Creek Catalog, where they are having a 50% off sale and have some gorgeous earrings on sale now for $35.00 to $40.00. Folks we are going to see much prettier ones for $5.00 and maybe up to $10.00, plus no sales tax or shipping charges. The same is true for necklaces, scarves, and purses. Buy that extra bag in Ecuador for $8.00, which I also saw in Puerto Rico for $40.00 to get home in and more and more of the wonderful savings. Another day we are going to the Village of Peguche, which is the Village of the Weavers. There are three things we will want to do in Peguche. 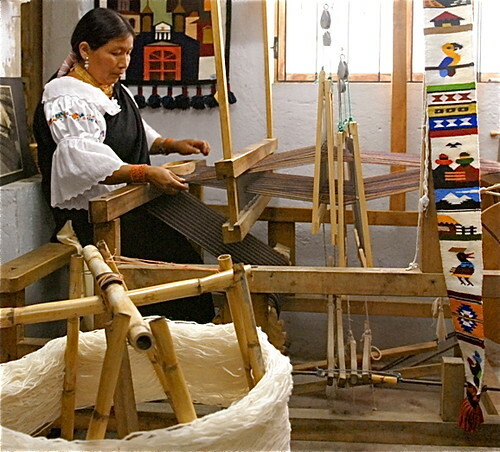 First, we will want to visit El Condor where people will be weaving as we watch a weaving exhibition. Also in Peguche is an artist, Jose Cotacachi, who does wall hangings. He exports to the United States and is shown in very high end stores at very high end prices. You too can do this. His work is breath taking, and the detail, well you will see what I mean. These sell to high in art galleries also. Very easy to pack, just roll up your purchases and put them in that extra bag you bought. Jose will ship to the U.S., but it is much cheaper to buy that $8.00 bag and do it yourself. 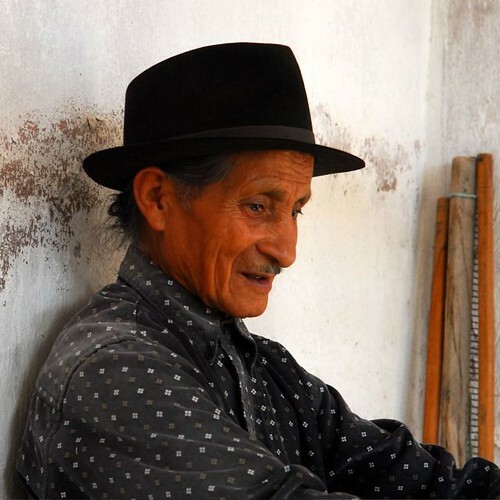 Jose actually has three different workshops in Peguche, and we will visit them all. 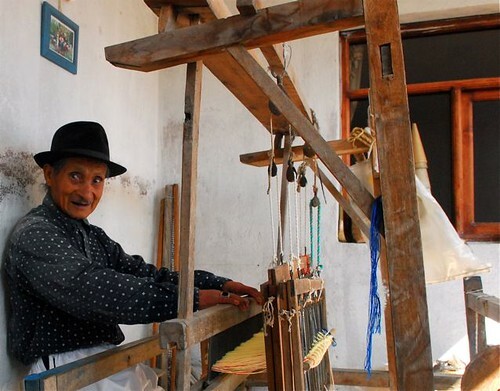 Jose Cotacachi at his loom. Depending on time, we’ll determine the next thing we do, so I am just keeping it a secret. I don’t want to rush anyone in this town. Every time we go to Peguche, people always want to go back. I hear too many times, “I wish I had bought that, or I didn’t see that one”. So on this trip, we are going to try and see it all. 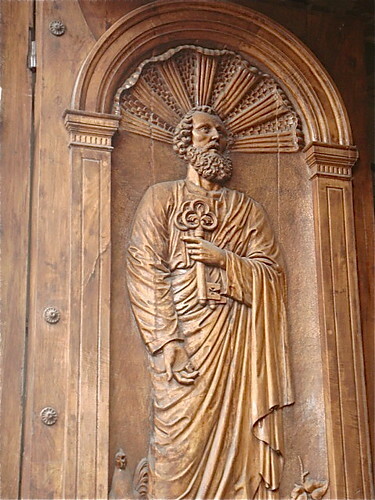 We will go to San Antonio de Ibarra, the Wood Carving town. One of the stores in San Antonio does gold leaf on statues…Some of these statues go to very important places in Europe and it can take a year or more to complete one statue. Also, one small woodcarver studio (dirt floor) hosts those direct from the Louvre in Paris…bringing pics of their treasures to be copied! 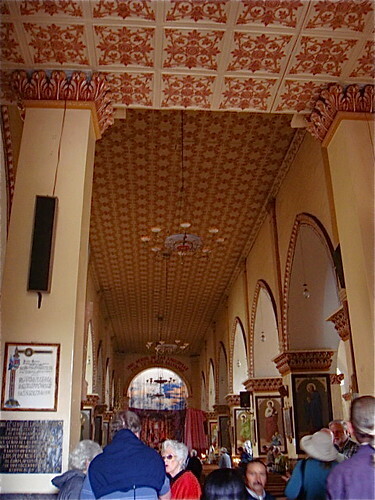 Many of the towns in Ecuador are known for a particular craftsmanship. We will be in the heart of the Crafts Trail, just minutes away from the major markets. Otavalo is the Indigenous Market town, Peguche is the Weaving town, Cotacachi the Leather town and San Antonio is the Wood Carving town. The particular talent… skill of each town is handed down generation to generation, family to family. Should a future generation of young people decide to leave the town and do something completely different the skill could be lost forever. You know it is going to happen, that is why all the things we see are so precious. Our first complete day in Cotacachi we are going to meet Roberto the man who grows and exports those wonderful Ecuadorian roses to so many of you in the United States. You have seen the roses in Gary’s emails. Roberto is going to tell us how to get them, and how to have your own Export business with roses. (Some past attendees of this course have done quite well selling roses direct from the source. And, a big thing, Roberto’s roses are all from green plantations…your wedding clients will love this. We will also be working the entire Leather Street (ArtePiel), which is only a three block stroll from El Meson. So many stores, both sides of the street, and all just a little bit different. 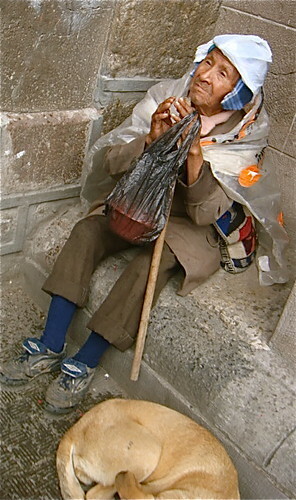 There is also a small outdoor market we will visit in Cotacachi where I have gotten some great leather items. 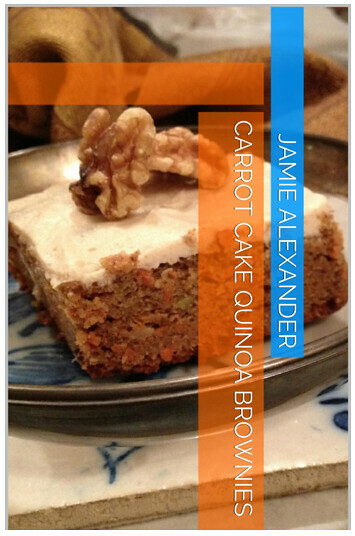 This is going to be a “get outside in the sunshine day”, do some walking do some looking, and do some buying. For all you guys coming along, one of the first stores we will visit is where you get those fabulous leather jackets and coats. The secret word in this store is…”I know Micky”, or “Micky sent me” which could bring about that extra discount we all want. I believe Micky will actually be in Cotacachi while we are there so we will all get to meet her and here about her businesses in Florida all from products bought in Ecuador. and not to be forgotten, your ATM Card! See you all in July. Happy traveling! met a man who reminded us that when we do business globally we do more than just make money for ourselves. 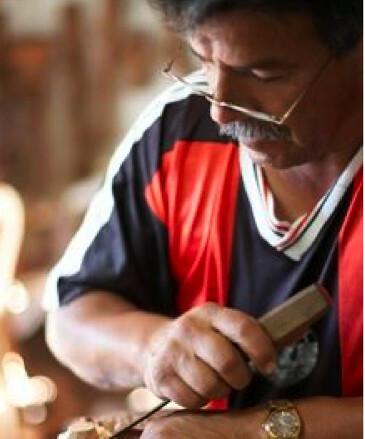 International trade in native crafts helps enrich everyone. We hope to share this opportunity with you.